Swedish climate activist Greta Thunberg (R) speaks during a debate with the EU Environment, Public Health and Food Safety Committee during a session at the European Parliament on April 16, 2019 in Strasbourg, eastern France. Sweden's teenage activist Greta Thunberg on April 16 urged Europeans to vote in next month's elections on behalf of young people like her who cannot yet cast ballots but demand decisive action against climate change. During a visit to the European Parliament in the French city of Strasbourg, Thunberg, 16, told a press conference that time is running out to stop the ravages of global warming. Swedish climate activist Greta Thunberg reacts during a debate with the EU Environment, Public Health and Food Safety Committee during a session at the European Parliament on April 16, 2019 in Strasbourg, eastern France. Sweden's teenage activist Greta Thunberg on April 16 urged Europeans to vote in next month's elections on behalf of young people like her who cannot yet cast ballots but demand decisive action against climate change. During a visit to the European Parliament in the French city of Strasbourg, Thunberg, 16, told a press conference that time is running out to stop the ravages of global warming. 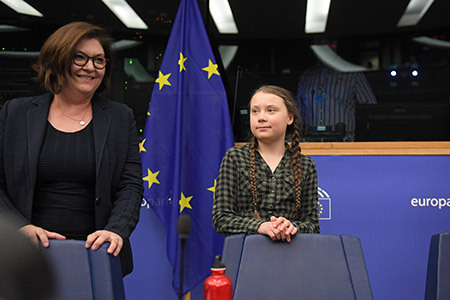 Swedish climate activist Greta Thunberg (R) arrives for a debate with the EU Environment, Public Health and Food Safety Committee during a session at the European Parliament on April 16, 2019 in Strasbourg, eastern France. Sweden's teenage activist Greta Thunberg on April 16 urged Europeans to vote in next month's elections on behalf of young people like her who cannot yet cast ballots but demand decisive action against climate change. During a visit to the European Parliament in the French city of Strasbourg, Thunberg, 16, told a press conference that time is running out to stop the ravages of global warming.